The days of the basement dungeon laundry room are numbered. Taking its place are a host of design ideas that elevate the laundry room, making it not only functional, but a beautiful space in its own right. Looking to give your laundry room a facelift? Don’t forget to consider the design tips below! Modern laundry room designs are all about maximizing storage and space. Your laundry room may be small, but that doesn’t mean it can’t be mighty! Before beginning any new project, be sure to consider the items and people that occupy the space. For example, do you have little ones running around? Then you might consider creating a specific place for potentially toxic soaps and detergents to sit – perhaps a high shelf, or a cabinet that can be locked. You could also install individual cubbies for sorting and storing each child’s clean clothing as it’s finished. Think beyond the basement! While most laundry rooms are often located downstairs, it certainly doesn’t make it the best place for them. If possible, consider moving the laundry room closer to the bedrooms for ease of access. Or perhaps on the main floor near the kitchen, garage, or mudroom. 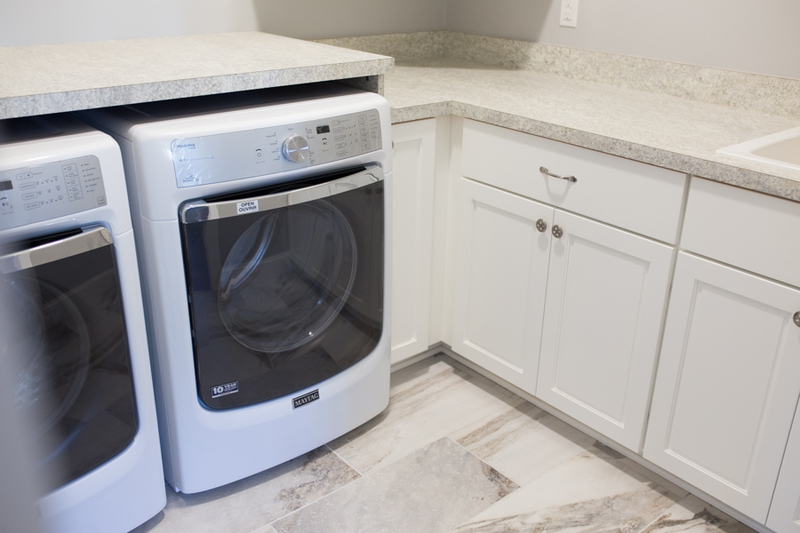 Remodels are all about making your home work better for you, don’t leave the laundry room off your list! How often do you do laundry? Washing clothing is a fairly regular chore, taking the time to give your space a bit of personality can go a long way! Putting unique touches on the laundry room can help take the drudgery out of your weekly wash time. Install a beautiful light fixture that brightens the space. Add a comfortable spot to sit as you sort light and dark loads. Or paint a fun chalkboard wall to leave yourself special clothing care notes. We all know the phrase, “worker smarter – not harder”, right? The same concept applies to any home remodel. Begin by designing your laundry room around the tasks that take place in it. Designate separate areas for clean and dirty laundry, or wet and dry clothing. The last thing anyone needs when doing laundry is confusing a freshly washed load with a dirty one. Create a natural path to follow, and design the room efficiently around its flow.